Accel World: The Problem with the Ultimate Virtual Reality Game! Accel World is an anime series about a junior high school kid who thinks of himself as a fat little loser and retreats from his real life into virtual reality games but doesn’t feel fulfilled even then until he is introduced to the most intense VR game ever, Brain Burst. 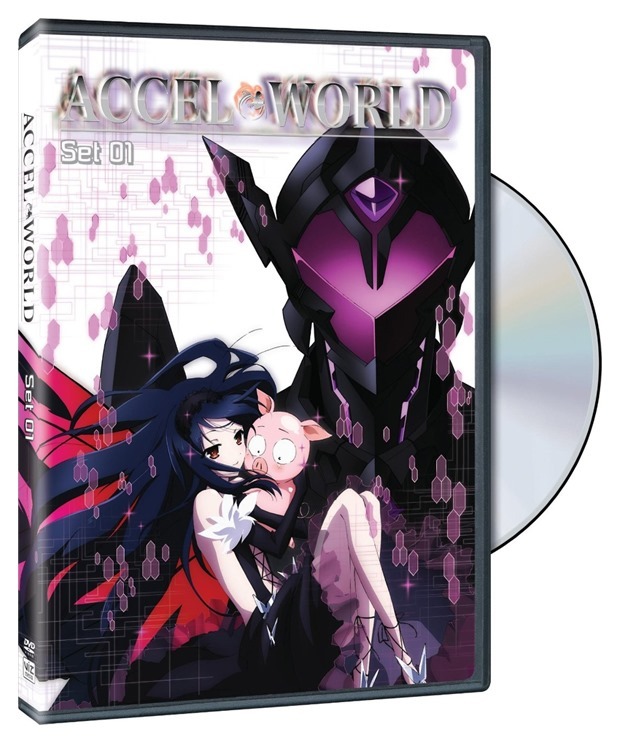 Accel World Set 01 is the twelve-episode first season and it’s one heckuva ride. Harayuki Arita is a short, fat boy who is in his first year of junior high school. He is constantly bullied by a trio of jerks and spends most of his time away from school playing various VR games – in one of which, he has scored the most ridiculously high score. This brings him to the attention of the vice-president of the school’s student council, a pretty, popular second-year girl named Kuroyukihime. She introduces him to a game called Brain Burst – the ultimate VR fighting game. In Accel World, the world is one in which everyone can plug into the Global Net through a link implanted in their necks. People can also use these links to connect with each other as though on a permanent personal cell phone – but for genuinely private communication, they can connect through a physical cable connection that cannot be hacked. Other than these technological advances – and the detailed VR games that can be experienced, through avatars, as if they were really happening – the world of the series is pretty much lie our own. Brain Burst can only be installed by children who had been connected to Globe Net from birth, so there are barely a thousand players. By fighting duels, players can rise through several levels – barely more than a handful have ever reached level nine – and they have created a non-aggression treaty to prevent anyone from achieving the mythical tenth level, which rumored to be the final level. Getting to level ten supposedly causes the game to shut down and uninstall from all its players. The top level nine players have become addicted to the game – and the power they enjoy as de facto rulers. They are Kings. Player avatars are two words and describe themselves – Harayuki’s avatar, Silver Crow, is an armored silver biped, for example. Though Silver Crow becomes a formidable avatar, Harayuki remains burdened with low self-esteem – despite the best efforts of Kuroyukihime, Black Lotus in the game. Kuroyukihime’s efforts to groom Harayuki have real world consequences – the time she spends with him causes his best Chiya to become jealous despite having a boyfriend, Taku, herself. Kuroyukihime’s efforts as Harayuki’s mentor/guardian also have a not unforeseen effect on her. Things become even more complicated when Niko, a bubbly fifth-grader appears in Harayuki’s apartment (his mother’s job keeps her traveling), claiming to be his cousin. Everyone has secrets, of course – some of them genuinely unexpected. The world of Brain Burst mirrors the environment of the real world, so one clash takes place in an analog of Harayuki’s apartment building; another in his neighborhood. The design of the world of Brain Burst – called The Accelerated World because one second in the rea world equals one hour in it – is detailed and quite disturbingly gorgeous. The various players’ avatars have colorful names (literally) – Cyan Pile, Scarlet Rain, Yellow Radio – and their designs are frequently very cool (an exaggerated clown/jester, a gigantic metal fortress). The action sequences are impressive and varied (though I am getting tired of players shouting the name of their attack before they unleash it) and built around the personalities or appearance of the main players and reflect – especially in the case of Harayuki – their evolution as people. The animation is better than average and writing is (with allowance for some irritating factors that seem to be endemic to anime in general) extremely good. The characters and their relationships –in and out of the Accelerated World – are fascinating and involving. The final episode hints at developments for the series’ second season, but has a satisfying conclusion to its main arcs. Like the best anime, Accel Word requires its viewers to pay attention. It explores the real world consequences of the game – obsession and addiction leading to personality changes both in terms of its main characters and one especially nasty avater and his player. It might not be as radical, or as ground-breaking, as Ghost in the Shell but it’s genuinely compelling stuff and one of the best anime releases of last year. Extras are minimal: Character Art Gallery; Text-Free Opening and Closing; Series Trailer. There is also the usual collection of promo trailers for other VIZ Media series. Previous PostTeaser: Late Night with Seth Meyers!Next PostSundance Channel Drama The Red Road To Debut on February 27!